When an ocean separates the two halves of your whole, it's worthy of contemplation. 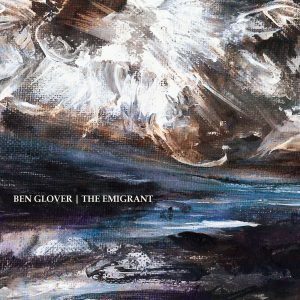 For Irish-born, Nashville-based singer/songwriter Ben Glover, that consideration comes in the form of his new album, The Emigrant, which folds his two worlds into one. Co-produced by Glover and Neilson Hubbard, the album features six traditional folk songs and four original compositions (including co-writes with Gretchen Peters, Mary Gauthier, and Tony Kerr) as Glover addresses the universal theme and personal challenge that is immigration. Though that hot topic lies at the heart of this pseudo-concept album, The Emigrant also concerns itself with how we deal with change, loss, and hope, as well as how we ultimately survive when faced with the trials and tribulations of life. "Over the past couple of years, I have been going through the process of getting my U.S. Green Card, so the reality of immigration was very present in my world," Glover says. Not only did he have to slice through a web of bureaucratic issues, he also found himself face-to-face with the bigger questions posed by the process. "Contemplations like 'What and where is home?' were never far from my thoughts," he adds. To work through it all, Glover turned to music. "Around the same time, my interest in Irish roots music and folk ballads was rekindled. My head and heart were back in that musical world. Having to deal with the issues of immigration while going back to the music I grew up playing is how this record was born. The project is my story — it’s who I am at this time in my life," he explains. Much like his current life, Glover's childhood in the sleepy seaside village of Glenarm in the north of Ireland had a soundtrack from both sides of the Atlantic Ocean. So, when he started playing gigs in the local pub at the age of 13, he played Irish music, of course, but he also slipped in songs from Hank Williams and Johnny Cash. In the summers of his university years, Glover paid his way across the pond by performing Irish folk ballads along with the songs of Christy Moore and The Pogues in the bars in Boston, while back home in the pubs of Ireland he was singing Dylan and Springsteen. In 2009, Glover relocated to Nashville and immersed himself in Southern culture. He began exploring the locations that were closely associated with the music he grew up listening to — Hank Williams' tombstone in Montgomery, Alabama; Johnny Cash's childhood home in Dyess, Arkansas; Robert Johnson's grave in Greenwood, Mississippi. Those experiences informed and infused the soul of his acclaimed 2014 solo album, Atlantic. With The Emigrant, Glover continues to search for his place in the world. "It all began with the song ‘The Emigrant,’" he says. "I started writing that on a solo writing retreat I went on in rural Ireland and ended up finishing it with Gretchen Peters in Nashville. When that song arrived, it unlocked a desire to make an album that brought together an older tradition with a present-day spirit." To fill out the set, Glover collected 15 or so Irish and folk songs he knew of that circled around the ideas of immigration, displacement, and searching. He also turned to another one of his most-trusted collaborators: Mary Gauthier. Glover is a frequent co-writer with both Peters and Gauthier, having won International Song of the Year at the 2016 UK Americana Awards with Peters for “Blackbirds,” a song which appears on Atlantic and serves as the title track to her most recent solo album. Working with people he was familiar and comfortable with allowed Glover to really dig in. "The main theme in all the songs had to be that the voice was of someone who was figuring out their place in the world," he explains. "Once I tried them out in the studio, it was evident which songs belonged on the album and which ones didn’t. Musically, I wanted to keep it raw and organic and let the Celtic roots of the songs shine through." Considering that the world's political climate is currently rife with stories of refugees and xenophobia, Glover hopes The Emigrant offers some bit of solace to its listeners. "I would never claim to know what it’s like to be a refugee or to have to move because your life depended on it," he offers. "There are universal feelings, though, that all migrants experience — feelings of restlessness and a longing for something that only home, or our idea of home, can give." "It can be a scary thing to be away from all you’ve known and all that feels familiar, and I hope this record gives something to people who are in that scenario. Just to hear someone else express what you feel can be enough to give comfort and reassurance. We are all, in our own ways, searching for our place in the world. Just like the emigrant, we all have a deep longing for peace and connection... to have a sense of safety that being truly at home gives." The Emigrant will be released on Proper Records on 30th September 2016.